Two Christian NGOs, Save Our Land (SOUL) and Watchdog Foundation, have decided to stage a strong protest in Mumbai against Mumbai Municipal Corporation’s (BMC's) “decision” to demolish the historic 450 years old Heritage Cross and the Graveyard of the Heritage Church of Our Lady of Remedy in West Kandivali. “Our Lady of Remedy Church is not an exception to this unholy nexus. There is a 32 storey tower very close to the church and there are no flat purchasers for the building and the building is lying mostly vacant due to narrow passage, which leads to the building. Therefore, it is clear at whose instance the local officials are acting to widen the SV Road in front the church”, the NGO says. 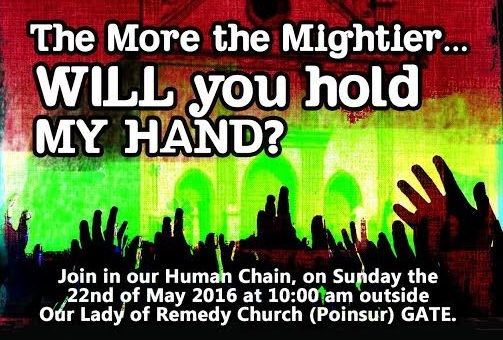 The demonstration has been proposed for May 22, 2016, at 10.30 am outside the Our Lady of Remedy Church, opposite Poinsur Depot, SV Road. The church was built in 1550, with Our Lady of Remedy High School is one of the oldest schools in Kandivali West, having been established in 1926. Alleging that the BMC “is hell bent on trampling the rights of thein the state, which are guaranteed under the Constitution of India”, the NGO communique says, on February 23, 2016, a chawl on the church’s property was demolished. And on April 21, 2016, the sub-engineer of the corporation came with officers and threatened the church employees. “There are at the moment approximately 100 graves. If the unwarranted demolition is carried out the Church stands to lose almost 50 percent of the graves, which will leave hardly any burial place for the parishioners of the Church”, it says. “As per the Development Control Regulations for Greater Mumbai, 1995, particularly, the Heritage Regulations for Greater Bombay, 1995 framed under Regulation No.67, lists some of the Churches in Grade II A of the Heritage Regulation and contribute to the image and identity of the City”, it adds.